If you like a cool and geeky t-shirt then check out this Apple Classic T-Shirt. This t-shirt is unisex making it perfect for both men and women and it is available in 17 colors and sizes Small – 3XL. 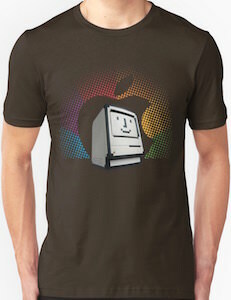 On the t-shirt you can see a classic Mac and it has a big friendly face on the screen and then behind the computer it shows the Apple logo surrounded by a bunch of colors and all that feels like Apple like it once was before we all get iPhones and other cool Apple gadgets. Come and show the heritage of Apple by wearing this Apple Classic T-Shirt. 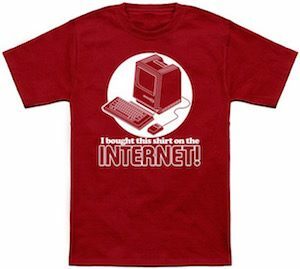 This t-shirt shows us a classic Macintosh from Apple and it’s place inside a white circle and below the computer it says in big letters “I Bought This Shirt On The Internet!”. Sure you bought this t-shirt on the internet as I don’t think you can buy it store. You can get this funny t-shirt in men and women’s styles in sizes ranging from Small – 6XL and yes besides red it is also available in many more fun colors so that you can get the color and size you want to wear. Come show the world this fun I Bought This Shirt On The Internet T-Shirt. 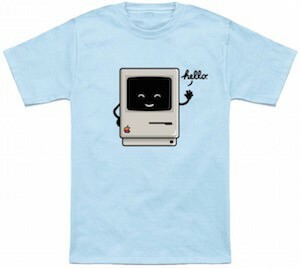 The good all Macintosh from Apple can be found on this cute t-shirt. 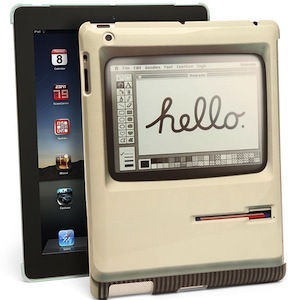 It’s just like the one Steve Jobs introduced so many years ago and this one can say hello to and even waves at you. Of course the floppy drive are there and so is the rainbow Apple logo. This fun Mac t-shirt comes in sizes Small – 6XL and comes in a bunch of colors to. And it does not matter if you are a man or a women as they have special cuts for either one to make this t-shirt fit the way you want it to. Come take a closer look at this Macintosh Hello T-Shirt. 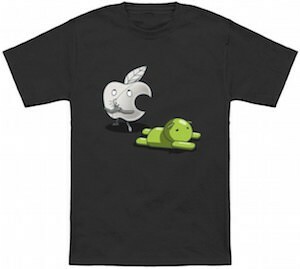 If you visit our site often then you know that I am a big time Apple user and for people like me there now is this funny t-shirt that makes fun of Android. On this charcoal colored t-shirt you can see a silver color Apple that seems to pretend that he doesn’t know what is happening but besides the Apple you can see the green Android lying on the ground like it tripped over something. Of course we know that the Apple logo made Android fall flat on his belly. And this funny Apple vs Android t-shirt is available in a men and women’s version in sizes Small all the way to 6XL so that all Apple fans can wear one. So lets not wait any longer and just order this Apple Tripping Android T-Shirt. Do you remember how awesome the classic Nintendo was, sitting back playing Frogger, Super Mario, Astroid, Ice Hockey …. Ohh the memories. Now you can remind youself of this awesome game system with this iPhone iPod case that looks just like the original Nintendo controller. That famous two toned grey color scheme with two red buttons “A” and “B”, a “SELECT” button and a “START” button and the analog “up, right, down, left”. Made to be a very durable hard case that snaps on easy and precisely fits the iPhone 3G, 3GS, iPhone 4 and 4S and the iPod Touch 4G and also the iPhone 5s and Samsung Galaxy S3 and S4. The Nintendo controller case will help protect your iPhone and iPod Touch aswell as leave you access to all ports and buttons. 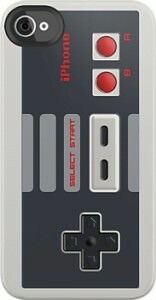 Have closer look at the Nintendo Retro Controller iPhone / iPod case. OK so you are like me an Apple user and some of us (maybe me included) go a little bit far about our love of Apple products. 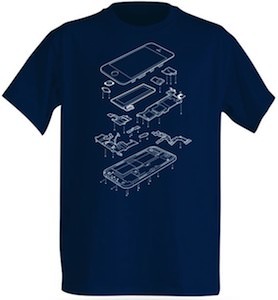 And now there is the navy blue t-shirt that shows an iPhone 5 all take apart and the parts a hanging in thin air almost like it exploded. The iPhone t-shirt comes in sizes Small – 3XL and is made from 100% cotton. It is just fun to have a shirt that shows the phone all in pieces and that is why of course want one. Come and order your iPhone 5 Exploding T-Shirt. This t-shirt shows a retro computer and yes of course it’s a mac. This classic Macintosh t-shirt comes in a wide range of colors and styles and of course lots of sizes to. You can get a styles for men, women and kids. 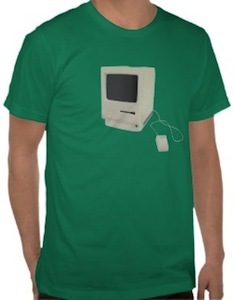 So if you like a shirt with a classic mac then come and get this Retro Mac T-Shirt. OK so your new iPhone 5 looks amazing and works great but still you are just a little bit afraid of hurting it. A case is a good way to protect your new Apple device and Case-Mate wants to help you with that. This case is black with but offers some fund pattern changes on the edges for a better grip. And this case has more, it has a build in stand so that you can just place it anywhere in portrait or landscape mode and you are ready to take pictures, watch a movie, look at a clock or what ever you want to do while you iPhone 5 is standing on it’s kickstand. So get ready to protect your best phone ever with the Case-Mate iPhone 5 Pop! Case With Stand. All Apple users know it when you switch to a Mac you never look back. And to get the world to know that you are a Apple user there is this special t-shirt. On the t-shirt it says “I’m A Mac” and below that the 3 buttons we all know from the left top corner of all our windows. 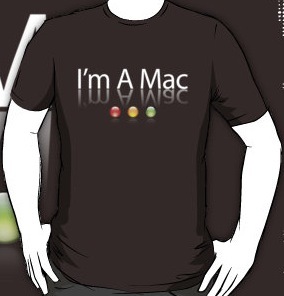 So if you are a Mac then come and get your I’m A Mac T-Shirt.